Even if you’re not in an active product evaluation today, you can keep apprised about products, vendors, categories you’re interested in by using the Follow feature in TrustRadius. 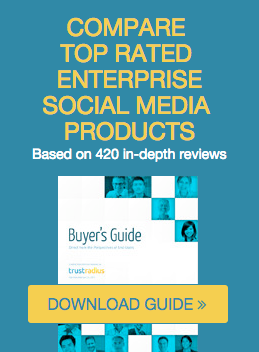 This feature allows you to follow products, vendors, categories, and people who you are connected to, so that whenever new reviews are posted, they are featured on your TrustRadius homepage in the “What you’re following” box. Much of our focus to date has been gathering in-depth reviews for different business applications. We believe that reviews are a helpful source of information to help professionals make more informed decisions. However, no matter how comprehensive a review may be, sometimes you just need to speak to someone knowledgeable to get your specific questions answered. Additionally, we are finding that people have expertise in products they’ve not yet reviewed. An important and really easy to use feature in TrustRadius is to add your system expertise. Simply click on your name, select My Profile, and choose the My Expertise tab. How Can TrustRadius Help You? Three of our beta community members were evaluating systems and asked for our help. A director of business applications at a high growth technology company was evaluating CPQ (configuration, pricing, quoting) applications. Their short list was BigMachines, BigMachines Express and Steel Brick. We were able to provide them with three in-depth reviews of BigMachines from different vantage points – a business analyst in IT, a director of legal operations, and a sales operations manager. The information helped them understand the total cost of ownership of the solution, which helped them make a final decision.